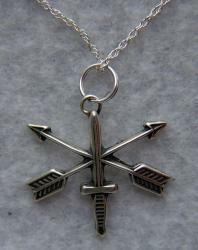 This is a handmade necklace of the US Army Special Forces in Sterling Silver. What better way to show you are SF than the cross arrows with a knife. You will not find this anywhere else we handmake them ourselfs. This necklace comes with an 18 inch sterling silver chain.